You’ve probably seen all kinds of “up-cycled” projects all over the internet. By “up-cycle,” I mean taking one item and making something else out of it. For example, buy a men’s sweater at the thrift store and turn it into a cute dress for a toddler girl, or some old drapes could be made into reusable brightly colored handbags. There are many ideas for up-cycling on the internet these days. 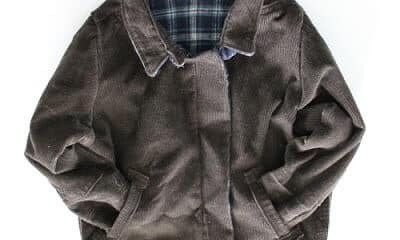 This past month, as I was sorting through my craft stash and trying to down-size, I came across a pair of size 7 boys corduroy pants that I previously gathered from my mom’s “going to the thrift store pile.” They were originally given to my younger brother – but he never wore them; they still had the tags on them. I have a two-year-old son, and I figured I would save the pants until he could wear them. But, as I was sorting, I dreamed up another idea for the corduroy beauties (or should I say handsomes?) – what if I could make a nice little jacket for my son out of them? This challenge was something I couldn’t pass up. After the pattern was completed, I unpicked all seams on the pants. I was a bit nervous about whether or not I would have enough fabric, and I figured this would be the best way not to waste any pieces. It turned out to be just enough! The scraps that are left are just that – they can’t be used to construct anything else! The only thing I purchased for this jacket was some flannel fabric. I still need to add some sort of closure to the front of the jacket, but I am having a hard time deciding what will look the best! In the end, I spent $7 for the fabric and thread, and still have plenty of both to make something else! Up-cycling is such a creative challenge, and after completing this project, I have found that it is possible to create just about anything from anything! If you would like to see more of my creations, please visit my blog, My Li’l Pumpkin Patch. Happy creating!